My 560SEC came with a set of Simmons wheels. These wheels are not to my taste and were too wide for the car. The wheels had been mounted with spacers which I do not like. On Thursday, I secured a great set of 15×7 Mercedes wheels which I fitted to the 450SLC. This meant that the ASA Type 8 wheels I had on the SLC were available for the 560SEC. These wheels have come full circle as I originally purchased them for a 560SEC. The ASA Type 8 wheels are a replica of the 8 hole alloy wheels found on cars such as the W140 and R129. 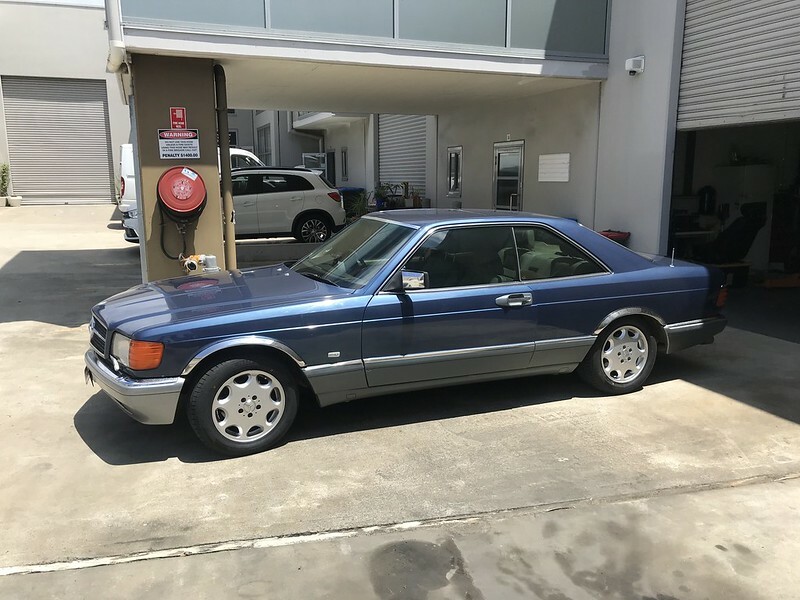 They are easy to keep clean and look good on the W126. At least when I purchased them back in 2009, ASA Type 8 wheels could be bought with both low and high offsets. These wheels are a huge improvement over the Simmons wheels. The 560SEC is an elegant car, but this one had been fitted with some gaudy accessories that I am slowly removing. After almost 10 years and 50,000km it was time to replace the Yokohama Avid V4S tyres on them. Given the mileage I now do on these cars, tread wear is not a primary concern. Tyres only last about 8-10 years even if they still have tread left on them. Based on the mileage I do, i went with a more budget performance tyre. It will be interesting to see how well they go. I purchased a set of Laufenn S FIT EQ. Apparently this is a subsidiary of Hankook and the tyres seem to get good reviews. At more than $50 per tyre less than Michelin it seemed worth a try. While I was having the tyres fitted I noticed a very familiar car. Back when I used to commute every day to the eastern suburbs between 1998-2001 I used to see this same car. Even though I don’t know the owner, I recognized the number plate (starts with MSA). 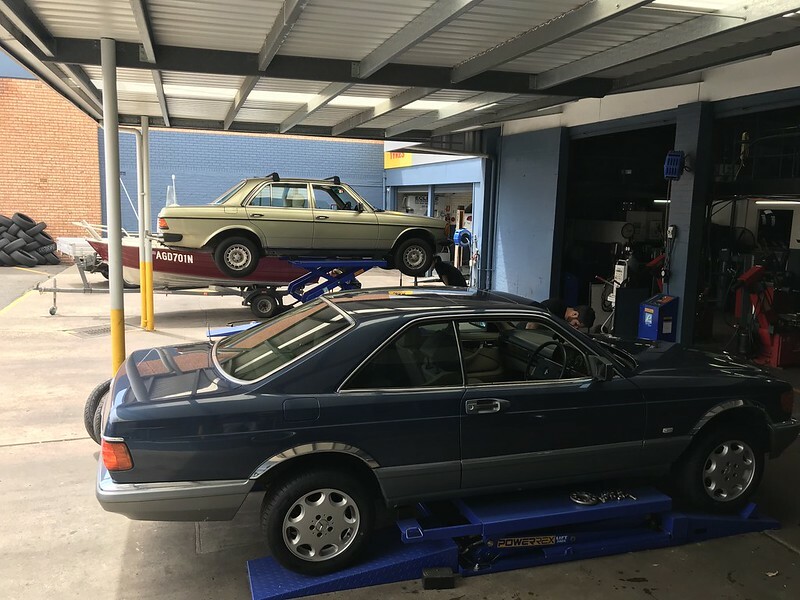 I remember it because I had a very similar W123 230E at the time. The fate of my 230E is unknown, so I am very happy to see this one still on the road. I am going on a Mercedes Club drive this evening. I was planning to drive the 250SE, but since rain is forecast, I will take the 560 and see how the new tyres perform.